Full disclosure: I am not a romantic comedy kind of gal. And no, I’m not trying to be a too-cool-for-school, feminazi who can’t enjoy a solid romcom romp. In fact, many times when I am coerced into watching one of these formulaic confections, I am delighted by how much I genuinely enjoy the fluffy fun. Given the choice, however, I will invariably veer toward darker genre fare. That being said, I was surprisingly curious about Jon M. Chu’s adaptation of the best selling romance novel CRAZY RICH ASIANS. I thoroughly enjoyed his dazzling style with NOW YOU SEE ME 2, and with his history of aptly capturing big production numbers in a series of music/dance centric films, I was interested in seeing what the talented director could bring to the romantic comedy genre. While Chu gloriously showcases the pomp and circumstance surrounding this classic Cinderella tale in the context of 21st century excess, unfortunately all the bling in the world can’t save this painfully predictable film. Rachel is a whip smart economics professor in New York. Raised by a Chinese immigrant single mom, Rachel embodies the American Dream. Her mother, a successful self-made real estate agent, was able to fulfill her dream of giving her daughter a better life in the United States. Rachel has been seeing her devilishly handsome boyfriend, Nick, for over a year. When he invites her back to Singapore to attend the wedding of his best friend and to meet his family, Rachel is over the moon. Little does she know, his plan has set off a social media storm within the tight-knit upper crust society on his island homeland. On top of this, Nick has managed to keep from Rachel the fact that he comes from one of the most wealthy and famous families in Singapore. Nick is practically royalty. Needless to say, when Rachel finally arrives in the Far East, she has much more to contend with than your typical meet-the-parents trip. I could go on more about the plot synopsis, but let’s face it- we all know how romantic comedies end. 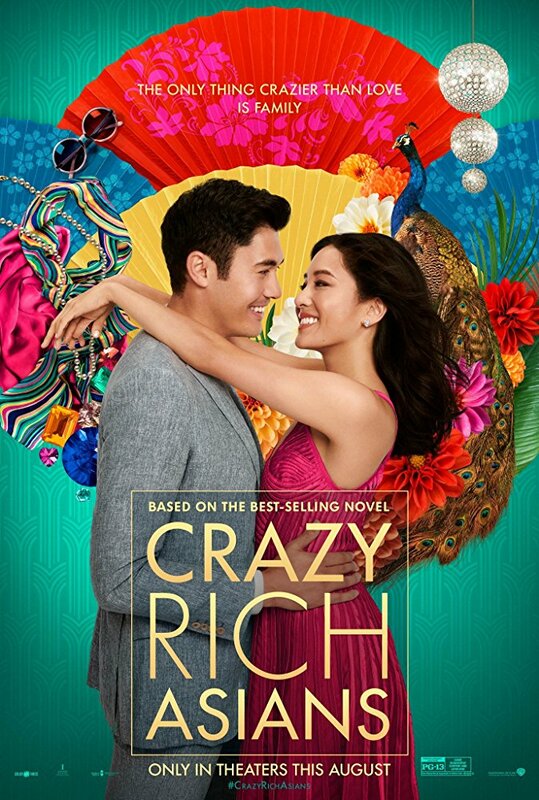 The events that get us there are what set some of these films apart from the rest, and Chu’s glorious depiction of the lavish lifestyles of entitled millennials is the true meat and potatoes of CRAZY RICH ASIANS. Sequences that showcase everything from elite air travel to ultra-extravagant bachelor/bachelorette parties and decadent shopping sprees are as intriguing as they are obscene. With his usual flair, Chu handles many of these scenes like musical numbers with resplendent imagery and a thumping tempo. True fans of romantic comedies will delight in the usual bells and whistles of the fairer genre. Aside from the aforementioned shopping spree, there’s also the obligatory makeover montage (lead by the equally obligatory gay cousin, of course) and an incredibly over-the-top wedding scene that will have many a moviegoer misty eyed. The only savior from all the girly girlness of CRAZY RICH ASIANS comes in the form of Rachel’s hilarious college BFF Peik Lin (rapper/actress known as Awkafina). As a native of Singapore herself, Peik Lin helps Rachel navigate her tricky and expensive new terrain, but she also provides some much-needed realness amid all the storybook perfectness. Her oddball schtick and comic relief is a breath of fresh air in the dense saccharine sweetness of it all, and I surely will not be the only viewer to google the talented gal as soon as the credits roll. Go ahead and take my money for whatever Awkafina’s next project is. As Rachel, Constance Wu is as likable, charming, and self deprecating; i.e. a perfect rom com leading lady. Though she is thoroughly convincing as the unwitting girlfriend thrust into a world of lavish lifestyle and strict societal dynamics, I couldn’t help wonder what she could offer if she wasn’t limited to the wide-eyed swooning that dominates her character’s demeanor in this outing. 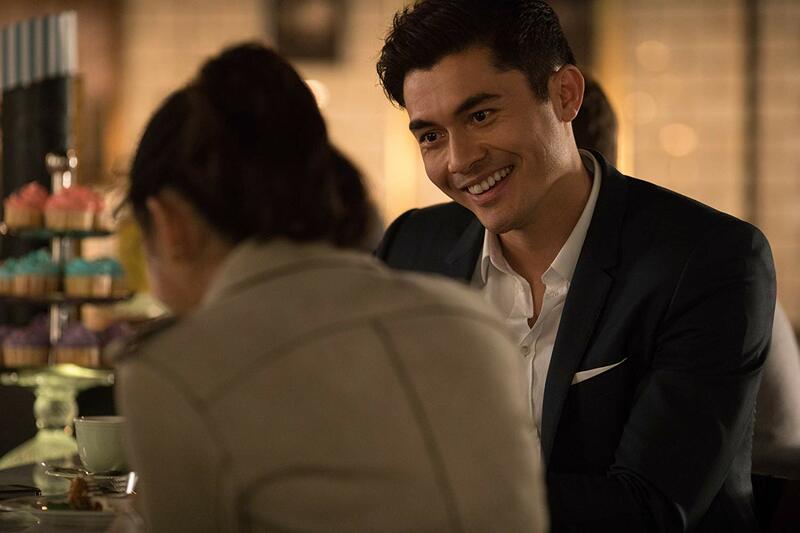 Accordingly, Henry Golding is note perfect as the hesitant heir. He is Prince Charming in every way- so much so that I found my jaded self wondering when his facade would eventually crack. But, alas, this knight in shining armor truly is the goods. He says all the right things, certainly looks the part, and is willing to put his family’s fortune on the line for the girl he loves. While many a film goer will gobble all this up, I just found myself wanting more for Golding than such a one-note character. 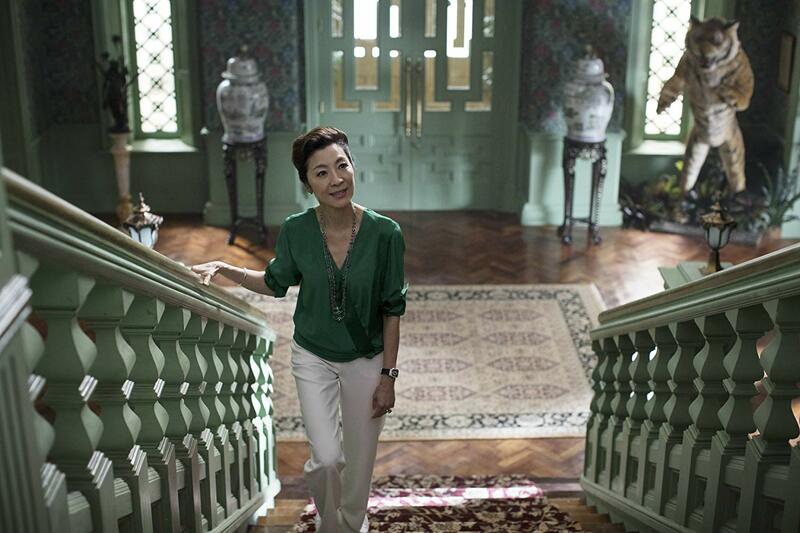 As Nick’s overbearing mother Eleanor, Michelle Yeoh slides perfectly into the role of the disapproving matriarch. She does a great job illustrating the protective nature of a mother who implicitly understands the responsibility of maintaining an empire, but sadly her character has little opportunity to do much more than glower. With all the perfectness abounding- even within the “conflict”- the story almost feels like fanfic. I have never read the original source material, but I was hoping that the film would transcend the usual sappy tear jerkers featuring a couple almost-kissing on the poster. Except for a few eye popping sequences of opulence, it is sadly just another cheesy romance wrapped up in a tantalizing bow. Definitely pretty to look at when I wasn’t rolling my eyes. 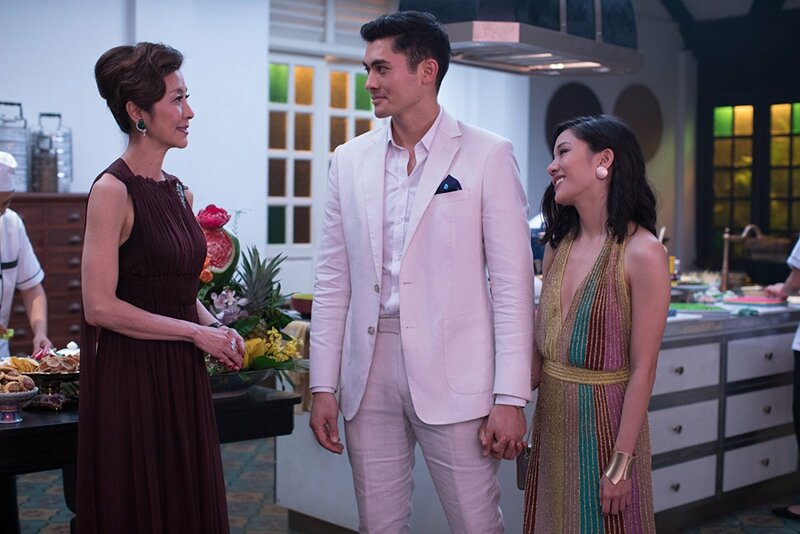 If you are a hopeless romantic CRAZY RICH ASIANS is for you, but if you’re only a casual fan of the feel good fare, beware.